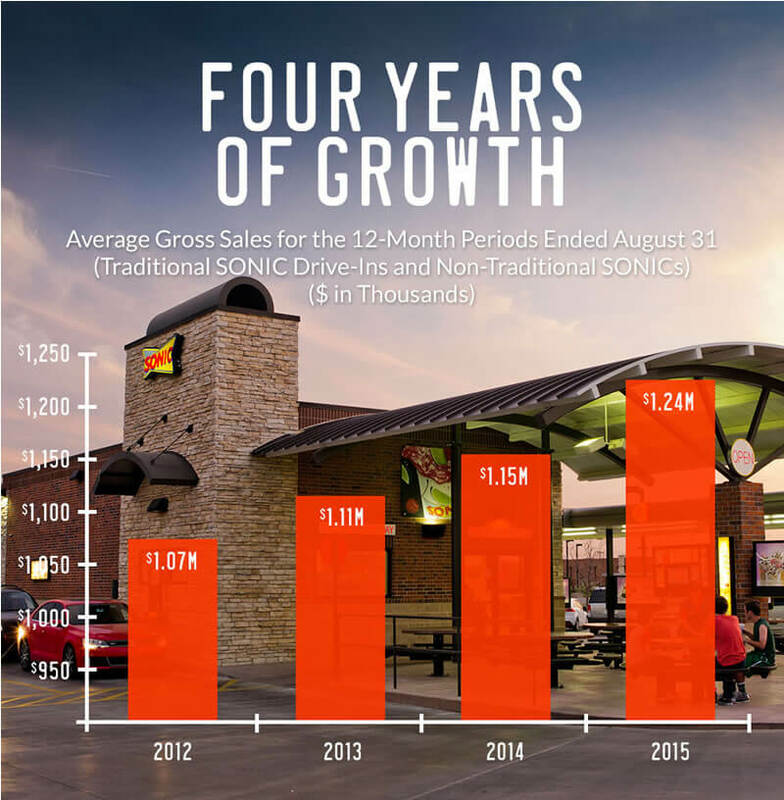 Increasing revenue, balanced dayparts and open territory make it a great time to own a SONIC franchise. SONIC® is the nation’s largest and most beloved drive-in chain, serving hot, fresh and made-to-order food for more than 60 years. We’re rapidly expanding and have available territory and ideal locations in all 50 states. SONIC is more than an iconic brand; we are a solid franchise investment focused on the future and backed by visionary leadership, robust national advertising power and operational excellence. There has never been a better time to become a SONIC franchisee. Leadership from a best-in-class franchise support team, a diverse menu that maximizes all five dayparts like no other QSR in the industry and the marketing muscle of the wildly successful Two Guys national campaign have positioned us as a brand with remarkable momentum. SONIC franchise owners saw average gross sales-by-store increase from $1,072,000 in 2012 to $1,246,000 in 2015, with more than 23 percent of our stores exceeding $1.5 million in gross sales in fiscal year 2015. At SONIC we pride ourselves on operational excellence. We strive to respect the deep relationships we have with our customers, and the drive-in model gives us strong advantages in the market. Customers park in colorful, canopy-covered spaces and push our signature red button when they are ready to order. That’s when the magic begins. A friendly carhop delivers made-to-order food and drinks directly to customers in their cars, which provides the comfort and familiarity of a mobile living room. The SONIC experience, which offers customization, control and choice, positions us as one of the most differentiated concepts in the QSR industry. At most QSRs, customers stand behind a cold and impersonal counter with other customers and wait their turn, or they approach the drive-thru menu in their car and wait their turn in a monotonous line. 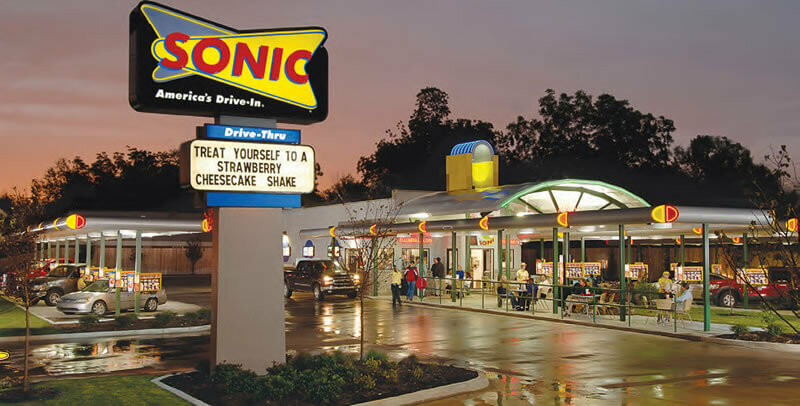 SONIC’s Two Guys advertising campaign is one of the most recognizable and successful advertising campaigns in QSR history, giving franchisees instant brand recognition and unprecedented advertising muscle on opening day and beyond. The Two Guys campaign resonates particularly well with Millennials, a growing customer base for SONIC, who seek out a fully customizable dining experience. The Two Guys campaign is loved by people of all ages and establishes our brand even in markets where we have not yet expanded. Our annual spend of almost $200 million creates familiarity with our products and pent-up demand in nearly every community across the U.S.
“Since we moved to a national media approach in early 2013, we have steadily increased our share of voice in the marketplace to the point that a franchisee who opens in a new area has a national advertising campaign working for them. They will be the leading advertiser in their community,” says Chief Development and Strategy Officer John Budd. What does it take to become a SONIC franchisee? The franchise fee is $45,000, with a total investment for a traditional SONIC ranging from $1.02 to $1.77 million (excluding land). The net worth of a partner can be used toward the total net worth/liquidity requirements. The term of a traditional SONIC franchise is 20 years, plus a 10-year renewal. Would you like to learn more about joining the franchisee family behind one of the most successful and unique QSR franchises in the U.S.? Fill out our request information form.